The Pennsylvania Railroad was the largest railroad by traffic and revenue volumes in the US throughout its 20th-century existence and, at its peak, controlled some 10,000 miles of rail line. As such, the Pennsy became known as the Standard Railroad of the World not only for the standard to which all other railroads could aspire, but standard in its equipment and structure designs as well. 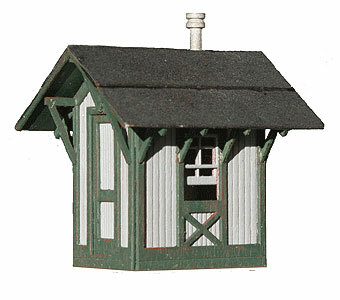 These kits are based on PRR standard prototypes that not only are a must for every Pennsy fan's layout, but look right at home on any model railroad dating from the early 1900s through the 1960s. Watch Boxes were placed at grade crossings where no automatic crossing gate existed. From these simple shelters, a railroad employee watched for oncoming trains and halted any road traffic approaching the crossing. While small in size, watch boxes still maintained a PRR identitiy along the line. The original 1879 design features vertical siding and includes Peel & Stick windows, doors, and trim, rolled roofing, exposed rafter tails, white metal smoke jack, and accurate side and end brackets. Copy this Pennsylvania Standard Watch Box - 1879 to your MY ACCESSORIES roster.